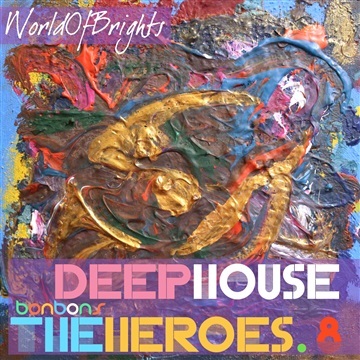 WorldOfBrights presents the VIII-th volume of the popular deep house / nu-disco series - "DEEP HOUSE THE HEROES VOL.VIII: BONBONS", which includes more than 80 excellent dance and ralaxing compositions, created in this popular style. The "DEEP HOUSE THE HEROES VOL.VIII" compilation was produced with the participation of musical projects al l bo, Artful Fox, Arvisound, Black Station, Clouds Testers, De Graal, Dimitri Twitz, DJ Alex N-Ice, Dj SeSSi Drive, Ess Kimo, Hopeful Peace, Inward Universe, Klara Rubel, laszlo Nikulin , Leerex, Nina Chenda, Nurture Art, PATHME, Pavel Gerasimoff, Petr, Rimos, Roman Sheylin, Roman Starikoff, Sairtech, Semenovb, SeventhSense, The Bestseller, The Soap Opera, among the countries - contributors of release Russia, Ukraine, Israel, Brazil, Morocco, Benin. In this compilation you will find 100% internet and radio hits "Walls Of Tears" (ft. De Graal '), "Kazatchok" (ft. The Bestseller), "Lady" (ft. Inward Universe), "Heye Kochavi" ( ft. Artful Fox), and completely new tracks, ready to attract the attention of DJs and listeners - musical gourmets. Instrumental karaoke versions of all songs are specially included in this release!